Maddy Pewtress won two individual events and swam on two winning relay teams Saturday at Multi-Generational to lead Eldorado’s girls swimming team to a 118-62 win over Chaparral. Pewtress won the 100-yard freestyle in 1 minute, 14.23 seconds and the 200 indivdual medley in 3:20.56. She also swam on the winning 200 freestyle and 200 medley relay teams. The Sundevils’ Kimberly Gonzales won the 100 backstroke in 1:43.44 and was second in the 100 freestyle, and teammate Jenny Paddack won the 200 freestyle in 2:44.05 and was second in the 50 freestyle. Chaparral’s Lana Simmonds won the diving competition with 117.4 points, swam on the winning 400 freestyle relay team and was second in the 200 freestyle. Basic 212, Desert Pines 27 — At Multi-Generational, Cerenity Sena won the 100 freestyle in 59.18 and swam on all three winning relay teams as the Wolves downed the Jaguars. Basic had eight swimmers win one event each, and Rebecca Estes finished second in both the 200 individual medley and the 100 breaststroke. Coronado 214, Las Vegas 60 — At Multi-Generational, Sophia Garritano and Sae Adachi each won one event and finished second in another as the Cougars rolled by the Wildcats. Garritano won the 100 breaststroke in 1:16.74 and was second in the 50 freestyle. Adachi won the 200 freestyle in 2:13.74 and was second in the 500 freestyle. Las Vegas’ Jessica Farnsworth won the 50 freestyle in 26.42 and the 500 freestyle in 5:33.44. Green Valley 195, Silverado 79 — At Multi-Generational, Raissa Gavino won two individual events and swam on the winning 200 medley and 400 freestyle relay teams to lead the Gators by the Skyhawks. Gavino won the 50 freestyle (26.48) and the 500 freestyle (5:31.89), and teammate Valerie Kitchens won the 100 butterfly (1:00.86) and the 100 breaststroke (1:08.46) and joined Gavino on the 400 freestyle relay. Green Valley’s Liz Clinch won the 200 freestyle (2:00.72) and was second in the 100 breaststroke, and teammate Cady Williams won the 100 backstroke (1:17.59) and was second in the 200 individual medley. Boulder City 187, Rancho 72 — At Multi-Generational, Rose Pouch won the 100 butterfly in 1:01.53, the 200 individual medley in 2:09.03 and swam on the winning 200 freestyle and 200 medley relay teams to help the Eagles top the Rams. Audrey Selinger won the 200 freestyle in 2:12.93 and was second in the 100 butterfly for Boulder City. Quinci Thomas won the 50 freestyle in 26.46 and was second in the 100 freestyle for the Eagles, and teammate Isabella Fecteau won the 500 freestyle in 5:56.29 and was second in the 200 individual medley. Rancho’s Astrid Villeda won the 100 freestyle in 54.43 and the 100 backstroke in 1:03.46. Tech 148, Canyon Springs 56 — At Multi-Generational, Karis Fernandez won the 100 breaststroke in 1:41.12 and the 100 freestyle in 1:13.41 as the Roadrunners topped the Pioneers. Riley Van Meter won the 500 freestyle in 7:51.40 and was second in the 200 freestyle for Tech. Canyon Springs’ Kyleigh Ancheta won the 200 freestyle in 2:36.80 and was second in the 100 butterfly. 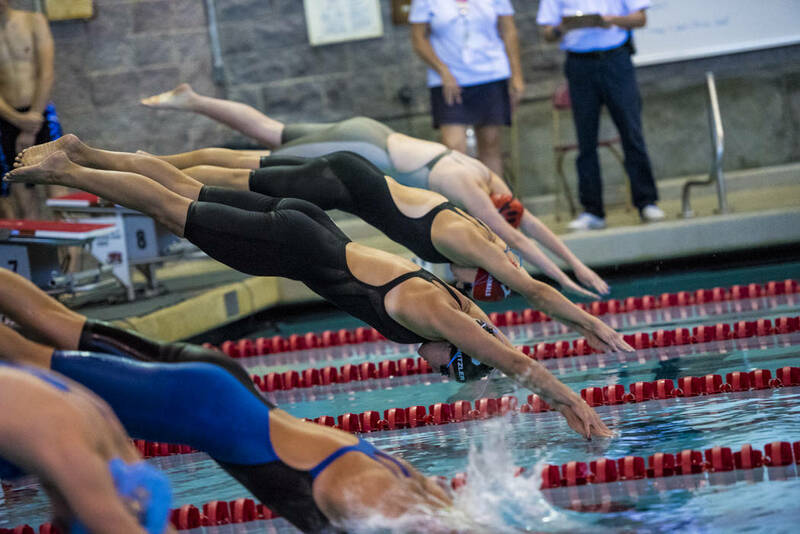 Valley 124, Del Sol 115 — At Multi-Generational, Anita Sanguansin won the 50 freestyle in 25.95, the 100 breaststroke in 1:09.71 and helped her 200 medley and 200 freestyle relay teams to victory as the Vikings edged the Dragons. Del Sol’s Bella Bindrup won the 200 individual medley in 2:58.47 and was second in the 50 freestyle. Foothill 155, Liberty 137 — At Multi-Generational, Faith Brazil won the 200 freestyle in 2:08.87, the 100 backstroke in 1:02.88 and helped her 200 freestyle and 200 medley relay teams finish first as the Falcons downed the Patriots. Liberty’s Brooke Blackard won the 100 freestyle in 57.46 and was second in the 100 backstroke, and teammate Taelyn Roberts-Oliver won the 100 breaststroke in 1:11.78 and was second in the 50 freestyle. Bishop Gorman 191, Legacy 62 — At Pavilion, Emma Breslin won the 100 breaststroke (1:09.03) and the 100 butterfly (1:04.59) and swam on the winning 200 and 400 freestyle relay teams to lead the Gaels past the Longhorns. Gorman’s Payton Moore won the 100 backstroke in 1:11.03 and was second in the 100 butterfly. Legacy’s Alyssa Hawkins won the 50 freestyle in 26.03 and the 100 freestyle in 57.0, and teammate Isabella Schutte won the 200 individual medley (2:20.00) and was second in the 100 breaststroke. Shadow Ridge 168, Centennial 124 — At Pavilion, Tori Mills swam on the winning 200 and 400 freestyle relay teams and placed second in the 500 freestyle to help the Mustangs top the Bulldogs. Shadow Ridge’s Haylee Buff won the 500 freestyle in 6:13.09 and swam on the winning 200 medley relay team, and Aubrey Nenneman won the 200 freestyle in 2:13.28 and swam on the winning 400 relay team. Centennial’s Chloe Day touched first in both the 100 freestyle (1:03.81) and the 200 individual medley (2:34.34), and teammate Kaly Rafie was first in the 100 backstroke (1:10.44) and second in the 100 butterfly. Palo Verde 200, Sierra Vista 105 — At Pavilion, Victoria Gutierrez won the 50 freestyle in 25.72, the 100 freestyle in 56.58 and swam on the winning 200 and 400 freestyle relay teams to guide the Panthers by the Mountain Lions. Sierra Vista’s Kayla Wolsey won the 500 freestyle in 5:21.31 and was second in the 50 freestyle. Arbor View 174, Faith Lutheran 109 — At Pavilion, Maria Cheng and Alana Domingo each won two individual events to lead the Aggies by the Crusaders. Cheng finished first in the 100 backstroke (1:08.84) and the 200 individual medley (2:27.08). Domingo touched first in the 100 breaststroke (1:18.12) and the 100 butterfly (1:12.72). Arbor View’s Madison Cvijanovich won the 50 freestyle in 28.58 and was second in the 500 freestyle, and teammate Joy Lewis was first in the 100 freestyle in 1:09.12 and second in the 200 freestyle. Faith Lutheran’s Adelaide Rau won the 500 freestyle in 6:05.18 and was second in the 200 individual medley. Western 167, Bonanza 70 — At Pavilion, Divine Hernandez won the 500 freestyle in 8:11.77 and was second in the 200 individual medley to lead the Warriors by the Bengals. Bonanza’s Gabriela Vazquez won the 200 freestyle in 2:37.25 and the 50 freestyle in 32.40. Cheyenne 112, Mojave 54 — At Pavilion, Noella Oviol won the 100 freestyle in 1:12.25 and swam on the winning 200 medley and 200 freestyle relay teams to guide the Desert Shields by the Rattlers. Mojave’s Noriah Cook won the 100 backstroke in 1:16.01 and the 100 butterfly in 1:15.07 and swam on the winning 400 freeestyle relay team. Clark 173, Cimarron-Memorial 55 — At Pavilion, Samantha Difulvio and Madeline Young each won two individual events and helped two relay teams to victory as the Chargers downed the Spartans. Difulvio won the 200 individual medley in 2:27.13 and the 100 breaststroke in 1:13.69. Young captured the 100 freestyle in 1:01.90 and the 50 freestyle in 28.44. Clark’s Eden Bulleman won the 200 freestyle in 2:36.13 and was second in the 100 butterfly.